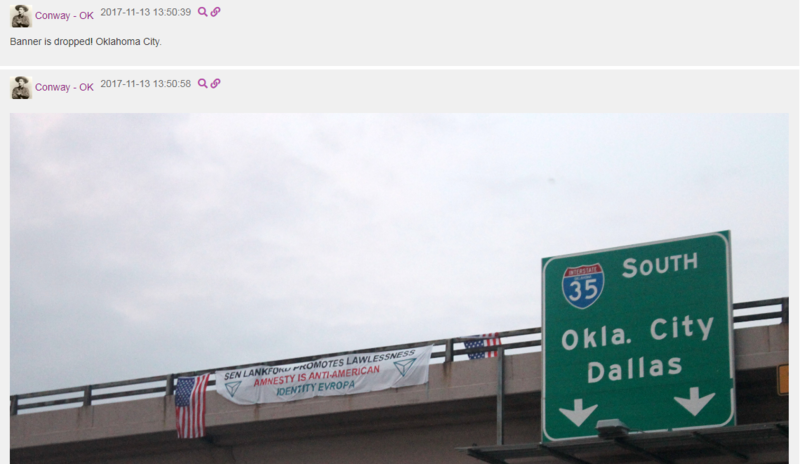 Oklahoma has been a hotspot of activity for the white nationalist organization Identity Evropa, which last month rebranded itself as the “American Identity Movement” after its chat logs were leaked by the independent media organization Unicorn Riot. 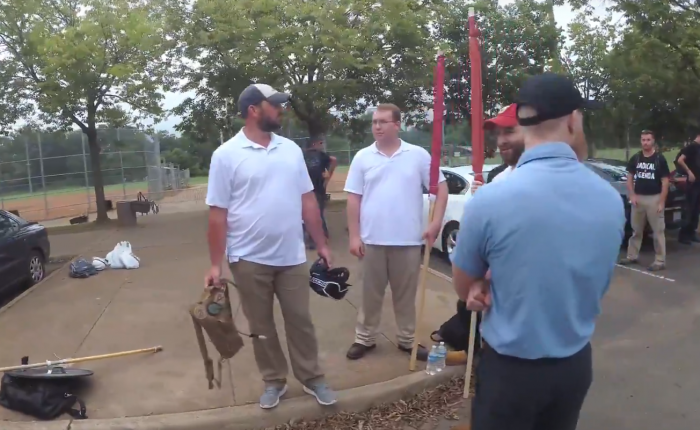 Right Wing Watch has learned the identity of the state’s coordinator, who, prior to the publication of this article, anonymously organized and recruited young men to the group and its white nationalist ideology. Identity Evropa is the original name of an organization that the Southern Poverty Law Center has recognized as a white nationalist hate group. The Anti-Defamation League describes the organization as “a white supremacist group focused on the preservation of ‘white American culture’ and promoting white European identity.” It was founded in 2016 by Nathan Damigo, a racist former felon who is currently a defendant in a federal civil lawsuit pertaining to the violence at the 2017 Unite the Right event in Charlottesville, Virginia. In November 2017, Patrick Casey took over leadership of Identity Evropa, and is the current leader of the effort now calling itself the American Identity Movement. The group heavily focuses on recruiting young, college-aged men to its ranks and constructs its messaging to resemble that of the European identitarian movement. Until Unicorn Riot published the group’s leaked chat logs, Identity Evropa operated under a veil of secrecy. The group opted for flyer campaigns and unannounced banner-drop events to spread its propaganda, and kept its membership numbers and member rolls out of public view. Its conferences were invitation-only and closed to the press. Today, Right Wing Watch is identifying a man who was working on behalf of the group in Oklahoma. 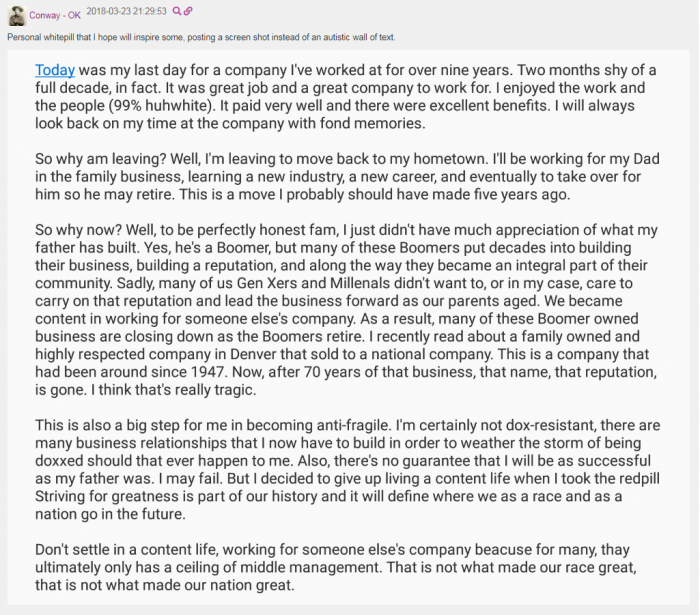 He is a man in his late 30s who wrote about moving back to his hometown to work for his father’s business with hopes of taking over when his dad retires. He’s a fan of the television series “The Walking Dead,” going so far as to name a dog after one of the show’s characters. But most importantly, and above all, he has been working in secret to build the ranks of a racist extremist movement in America. His name is Judson Gannon Blevins. He was Identity Evropa’s Oklahoma state coordinator. “That old phrase, ‘You will not erase us, you will not replace us,’—we have to have that attitude. Every single day we have to have that attitude. We have to be of that mindset and we have to spread our message to other people,” Blevins said on the now-defunct podcast. 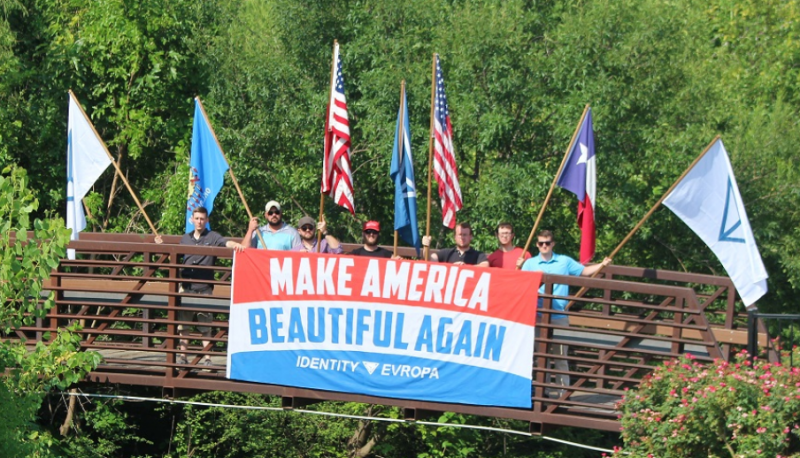 Blevins played a central role in Identity Evropa’s Oklahoma organizing: He posted photos of propaganda posters that he said he hung near a dog park in his community; he claimed to have helped drop an Identity Evropa banner over an Oklahoma highway, and he hung flyers in downtown Oklahoma City, Oklahoma. In another post, he said he interviewed a prospective member, and in other posts, users thanked him for organizing an Identity Evropa event for members in the state. Blevins has praised neo-Confederate leaders including Brad Griffin (“Hunter Wallace”) of the League of the South, has targeted reporters and activists combating hate in the United States, and celebrated Paul Nehlen, a neo-Nazi candidate who unsuccessfully ran for the U.S. House of Representatives in Wisconsin. In one Discord message, Blevins directed participants in the chat to a newspaper column in the Enid News & Eagle, a newspaper based in the place Blevins described as “my hometown.” In a post made last year, Blevins shared personal news that he was moving back to Enid to work for his father’s business, and expressed that he would need to build business relationships able to “weather the storm” if his identity were ever publicly revealed. 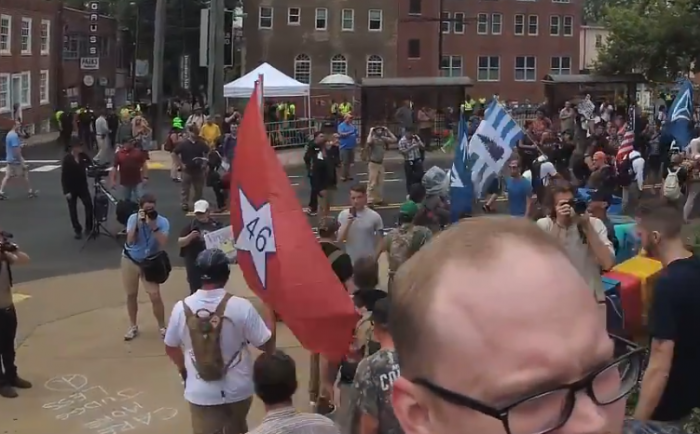 Photos and chat logs make clear that Blevins attended the Unite the Right 2017 convergence on Charlottesville, Virginia. 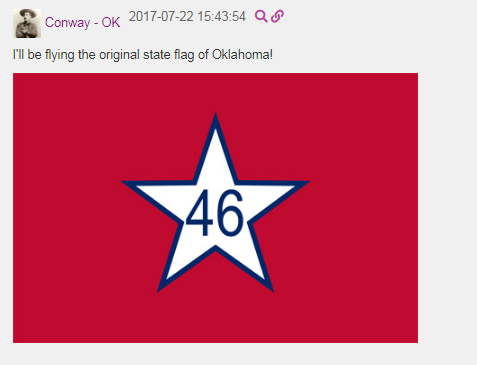 He posted in a Unite the Right planning server that he would be flying an Oklahoma 46 flag at the gathering—a promise on which he followed through. Prior to the event, he asked other Unite the Right attendees whether a baseball bat wrapped in barb wire—a weapon he said he made to accompany his Halloween costume of The Walking Dead character “Negan” in 2016—would “be a bit excessive to bring” to the gathering. Photos of that same barbwire-wrapped bat were also uploaded to image sharing site Imgur under an account that shared the photos on Reddit forums that Blevins linked to in the Identity Evropa chat leaks. On that account, he also expressed his lust for far-right activist Lauren Southern and her sister Jess, scolded the British actress Sophie Turner for her appearance, and defended the merits of white nationalist groups like Identity Evropa. The Imgur account’s display name, “Oorahokie,” was used for other social media accounts on multiple websites and forum boards by someone identifying themselves as Blevins and expressing interests consistent with Right Wing Watch sources’ own descriptions of Blevins’ interests. Right Wing Watch used information from those accounts, in addition to consistencies in other narrative accounts, to establish Blevins’ identity. Additionally, a Right Wing Watch source said they had spotted Blevins returning to an Oklahoma airport around the time leaked flight plans for Oklahomans attending Identity Evropa’s “Leading Our People Forward” conference suggested he would be arriving there. 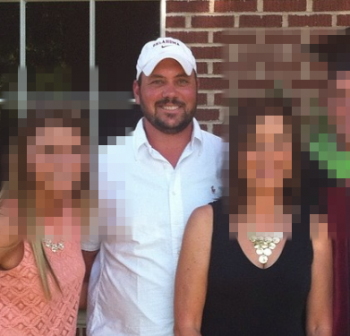 Right Wing Watch attempted to reach Blevins via phone at his father’s business in Enid, at which he told his confederates in an Identity Evropa chat he’d be working once he moved back to his hometown. We left a voicemail that went unreturned. Right Wing Watch also attempted to reach American Identity Movement (formerly Identity Evropa) for comment via a submission form on its website but the request was not answered. We also tried to reach Blevins at a cell phone number that he used to communicate with a Right Wing Watch source, but have not received a response.